I saw my eye doctor for the last time for a while and got my medical for my new job so now I was ready to get out of Dodge. I decided to wait until Sunday Apr 26 to leave. I will be driving up the 5 so wanted to keep traffic to a minimum (HA!!) going thru LA. It was still a rat race and only made it to Castaic where I called it quits. I was tired, the wind was blowing and it was getting late so I pulled into the Valencia Village RV Park for the night. I got up the next day with hopes of moving on but the wind was really blowing with gusts up to 35 mph. I don’t know about you, but I hate driving in the wind, so I paid for another night. Then I realized there is a Camping World not far away. I had a rear vent cover blow off some where in my travels and was trying to replace the cover. But on a 1992 rig that is just about impossible. I couldn’t find anything on line. Many of the components used on my rig are no longer being made. I headed to Camping World to see what I could do. While there I found out they could replace my rear bathroom vent with a fantastic fan. They had one in stock so I paid for it and scheduled it to be replaced the following day. That meant I would have to stay another day at the park as they couldn’t replace it until 3:00. 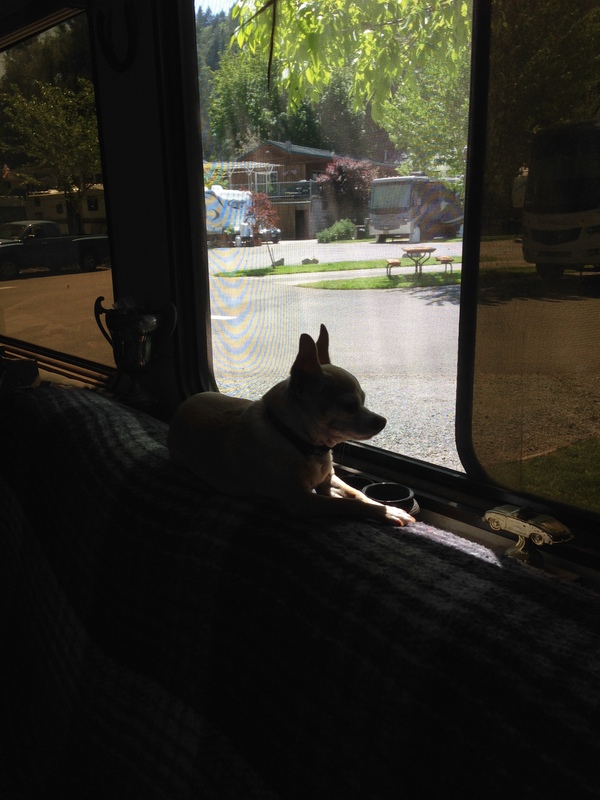 The following day I drove the rig to Camping World and checked in. I asked them if I could bring Chica into the customer waiting room. Camping World is very dog friendly so she came in with me. Immediately she was a big hit. Many of the staff came in to see here. At first she was a bit overwhelmed, but she finally got used to everyone. Sorry but I didn’t think of taking pics. It took a bit longer then I expected as they were very busy, but finally finished and now I have a really nice rear fan. We headed back to the park and spent our last night there. By the way this is a great park if anyone wants to visit Magic Mountain. It is only a couple of miles away. The next night we stopped at the Visalia Elks Lodge. For $10 I had a great rib dinner and met lots of nice people. Then it was on to the Lodi Elks. I was invited to their Happy Hour and met a lot of fellow RV’ers. My next stop was the Red Bluff Elks Lodge where I only spent one night. I love the Elks Lodges since they usually have full hookups and only cost $15 – $20 per night. They all have a nice bar and many nights I get a great dinner. I was going to cross into Oregon and stay at the Ashland Elks Lodge. Forget it! They only offer parking in a parking lot with very little space. I did see a red/white 24′ LD but there was no place to park. I checked Allstays (great APP for locating campgrounds) and there wasn’t much around the Ashland area so it headed north to Medford. I found the Medford Elks Lodge and parked in front as I couldn’t see any RV’s. They had a sign on the door that said the lodge had been closed down. Not sure what that was all about but I needed a place to stay as it was getting late. I decided to keep heading north and stop at the first RV park I could find. I landed in Rogue River and the first park was full, but they suggested another park next door to them. I really landed a gem. It was $35 per night which is more then I usually like to pay, but she put me right on the Rogue River. It is a really clean park with great showers. We walked right out our door and the river was only ten feet away. Chica loved looking at the Canadian geese that lived on the river. The next morning I got up and paid for another day. I needed to relax a bit as we had been driving every day. The owner suggested going into town for breakfast and that sounded like a good idea. 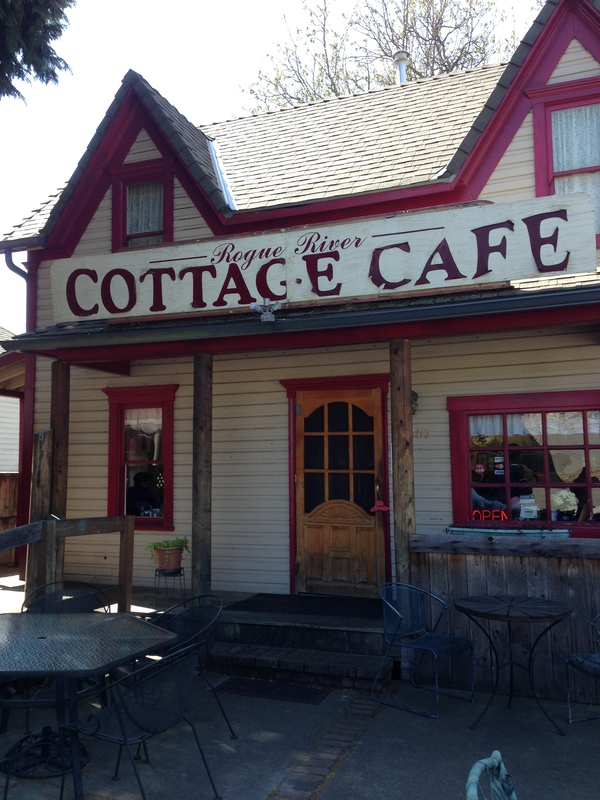 I had a great breakfast at the Cottage Cafe and it was really good. Since we were right on the river we saw many Canadian geese. In the evening they would come out of the water and feed on the grass around our rig. Of course Chica had to let them know who was boss. Our last stop before my summer home was an Elks Lodge in Salem, OR. I stayed there for 2 nights to get organized before heading to the campground at Lake Harriet. I called my employer to get last minute info about the next few days and instructions on getting to the campground. Then it was honey do stuff. I took Chica to PetSmart to get bathed and groomed and have her nails trimmed and I got a haircut. Then I did a some major shopping for groceries. Today I am heading out to my new campground at Lake Harriet. I will be passing through a small town called Estacada which will probably be where I will be doing my weekly shopping. I am not sure what kind of cell phone or Internet service I will get at Lake Harriet so here’s hoping with my booster I can get connected. 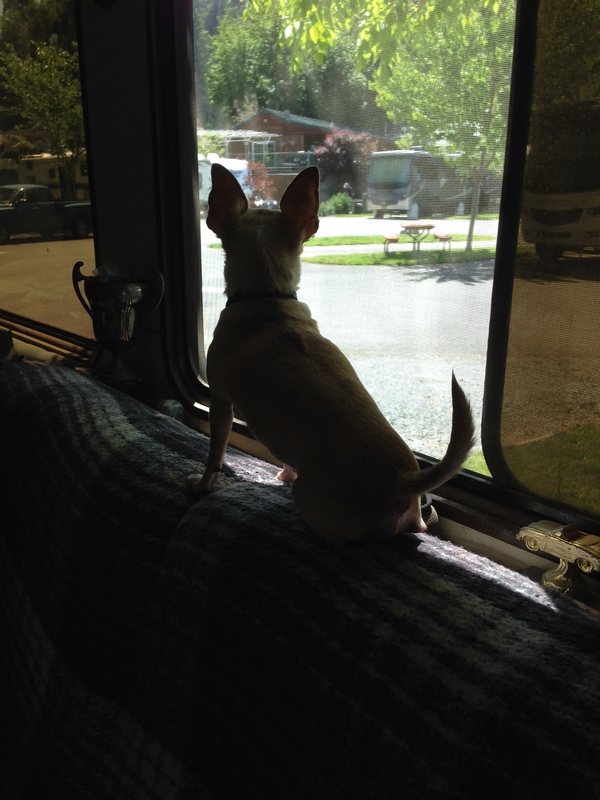 This entry was posted in Chica, Elks, Oregon, Salem, Summer Camp Host, Workamping and tagged Amazon workkamping, Chica, Oregon by Jim Melvin. Bookmark the permalink. I was wrong. It actually was $25 per night as I have Passport America. I saved $75 and the card only cost me $44. Not too shabby! Duh! I didn’t even look to see if they are a PPA park – we are members! I was just inducted into the Elk’s a couple of weeks ago. I’m really looking forward to visiting different lodges on my summer travels in my Lazy Daze. What will you be doibg this summer in your job? I will be a Camp Host. I sure hope you didn’t get a haircut at Pet Smart! 🙂 Cute how Chica wins over everyone, no surprise, and darling photos. Good luck on camp hosting. Other than traffic it sounds like the trip north went really well. That is always a good thing. How could anybody not fall in love with Chica. Have a great summer. Where is the campground? I’m on the Oregon coast hosting and love it. Cool! I’m heading to Colorado from CA today. 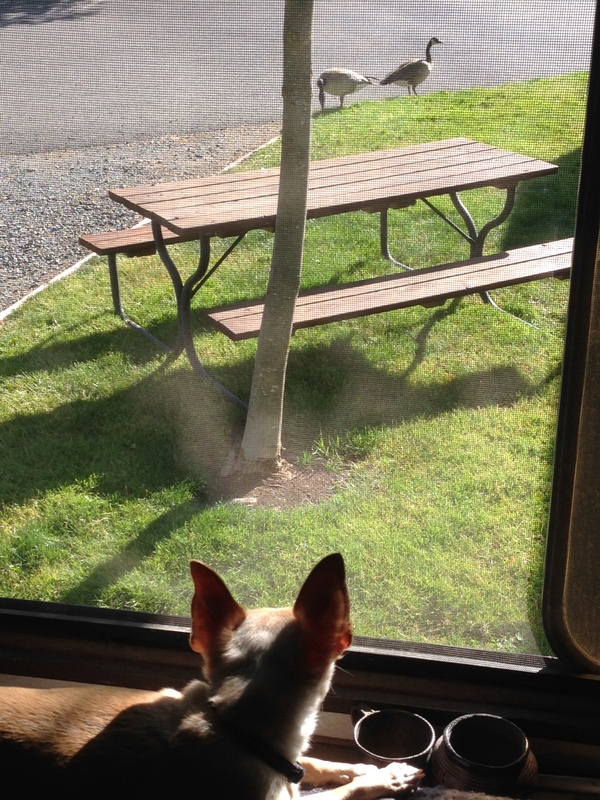 Love the pics of Chica eyeballing the geese. She really kept tabs on them. I hope you have a great summer as a Camp Host at Lake Harriet. Great trip description, Jim, Thanks for sharing this again and have a happy stay in your CG.